A Winery Picnic - what is better than a day in the sun with your sweetie, a basket of your favorite goodies and a great bottle of wine, enjoyed while surrounded by vineyards? Most Wineries allow picnics and some provide extensive facilities for visitors. If a Winery allows visitors to pack in their own food and has tables available, Winery-Sage.com considers them Winery Picnic friendly. If outside food is not allowed or there are not facilities to relax and enjoy your treats, then they are not considered Winery Picnic friendly. Note that a few Wineries have kitchens, delicatessens or full-fledged restaurants to provide Visitors with food. While still not considered picnic friendly, whatever facilities they have available to purchase food will be listed in the details section of the Winery's Encyclopedia page on Winery-Sage.com. 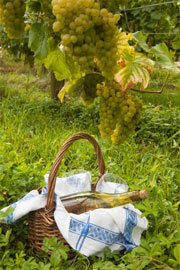 If you haven't experienced it, a picnic at a Winery is one of life's simple joys. For a listing of Winery Picnic Facilities, click here the button below.